Buying presents for men is difficult enough without you wanting to make sure you’ve chosen something which is both meaningful yet different to what everyone else is going to get. That’s where this list will come in handy. It has so many amazing gift baskets for men; the most difficult thing is choosing which one to go for! If you need to get an extra special gift for a man you know, you can’t go wrong with this gorgeous Dom Perignon champagne gift box. He’ll receive a bottle of this amazing vintage champagne inside a beautiful keepsake box which has been engraved with a personalized message plaque. There is nothing better than diving head first into some junk food and there’s no better time to do that than on a special occasion. Let him treat himself on his special day with this gift basket; it’s brimming with delicious sweet and savory treats which taste oh so good! Whether you give this to your son who is just leaving for college or to your husband who wants to relive his college days, this gift basket for men will be well received. You can personalize it with their favorite college team and add their name, as well. When he goes off on those long fishing trips, we bet that you worry about him. With this gift basket, you won’t need to wonder whether he’s eating enough because everything he needs is inside. Biscuits, crackers, and smoked salmon are just some of the items he’ll be tucking into while he’s getting his pole wet! Perfect for any golfing fan, this gift basket contains a mixture of edible treats and golf related items. He can drink the Golfers Morning Coffee with some shortbread biscuits, while reading The Golfer’s Book of Wisdom and preparing his golf bag ready for the afternoon’s game. Godiva make luxury premium chocolates which no one can say no to. Ideal for any chocoholic, this gift basket contains a delicious assortment of tasty cocoa treats such as milk chocolate pearls, dark chocolate almonds, and chocolate covered pretzels. It truly is a chocolate lover’s dream. 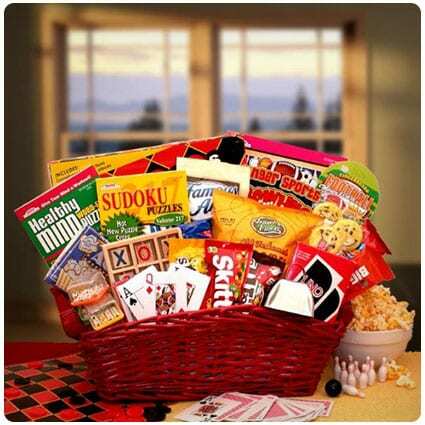 If you and your family have regular game nights, this is the gift basket for you. It’s filled with all sorts of snacks and goodies for you to enjoy while you’re playing your board games. There’s also 3 puzzle books and a mini checkers game set for you to add to your collection. If you love a glass of wine in the evening with your husband, this gift basket will benefit both you and him. It’s filled with goodies which are just perfect for anyone who loves wine. It includes some humorous socks, a candle, wine glass, and some tasty treats which will go perfectly with your tipple. There is nothing better than an ice cream cone, is there? Especially when it’s topped with tasty sprinkles, candies or sauces. If your husband loves a cone in the summer, this hamper is perfect. It has everything he needs to create his perfect iced treat; all you need to supply is the ice cream. Family game night is something that we should all try and have in our households. Once those kids grow up and go off to college, you’ll wish you’d spent more time together as a family, and this gift basket has everything you need, from games to snacks, to make games night a success. Going to the movies is one of life’s simple pleasures but when you want to take your kids along, it can get real expensive. Why not have a night in where you all watch a film? This gift basket will make it seem like you’re actually watching it on the big screen. All men love a good BBQ but when you’ve spent the day on the beach, the last thing he wants to do is go home and start grilling. With this portable barbeque gift set, he’ll find everything he needs to get that grill going wherever he is. When it comes to finding gift baskets for men who love to fish, it’s not an easy task, but this tackle box filled with everything he needs to have a great fishing trip might be just what you’re after. There’s an assortment of tasty goodies which means he’ll never go hungry while he’s trying to catch a bite. This will make the perfect addition to your summer BBQ, garden parties or picnic. As well as tasty barbeque Popchips and toffee pretzels, there’s also a grilling spatula, 2 condiment containers in red and yellow, and some BBQ sauce all of which will make your party guests happy. Everyone loves a good slice of pie, especially when it’s apple pie served with warm custard. Get the man in your life this gift crate which is filled with everything he needs to make you the perfect apple pie. As long as he follows the instructions, he’ll be fine. Whatever the special occasion is, this Grand Indulgence hamper will be well received. It has some delicious gourmet snacks, both sweet and savory, which are equally luxurious and tasty. There’s also a bottle of crisp French lemonade for him to wash it all down with. As well as the three bottles of Soiree Red, Chardonnay, and Cabernet Sauvignon, there’s also some gourmet goodies which will go well with all three of the rich and crisp wines which are included. They come presented in a keepsake leather tote which can be used long after the snacks and drink have been consumed. Named after one of the most well known islands in the world, The Manhattan gift hamper is filled with premier gourmet treats which would fit right in in the Big Apple. Honey sticks, toffee popcorn, and oatmeal tea cookies are just some of them. Every golfer needs a full stomach to play at his best – they’ll all tell you that. Inside this bag, which also doubles up as a cooler, you’ll find all the snacks he needs to keep his game in top form. Trail mix, orchard bars, and some sugary candies to keep his energy up…he’ll love them all. Whether he needs to get better after an operation or illness, or whether he simply needs cheering up, this gift basket will do just that. The yellow smiley faces on the box and balloon inside will raise a smile, but it’s the snacks and games which will really make him happy. You’ll find four types of rich and creamy cheese inside this hamper – it’s the perfect gift for anyone who loves this dairy delight. As well as the artisan cheese, there’s also some delicious accompaniments which will pair beautifully with them, and they’re all presented inside a practical cooler bag. If you need to buy a gift for a man who is an absolute foodie, this gift basket will have everything you need. Smooth crème caramels, crumbly oatmeal tea cookies, crisp crostini, and some gooey Camembert are among the gourmet goodies waiting to be discovered inside this hamper. Diving face first into some junk food is one of the best things in the world, even if we’re not allowed to do it that often. Whether you’re buying this for Dad or your husband, every man who receives this care package will love the delicious naughty snacks included. Perfect for those game night parties you throw, this gift basket has a selection of classic board and card games which will go down a treat with your guests. There’s also some tasty snacks including Oreos and Jelly Belly beans, so all you need to supply are the other players! Nothing says balance like a gift hamper filled with chocolate and fruit. The crisp and juicy pears, apples, and plums will pair wonderfully with the rich and creamy premium Godiva chocolate. If you’re looking for gift baskets for men, this one is a perfect fit. It doesn’t matter which sport he’s into, this sports theme gift basket is sure to be a hit with that special man in your life. It’s made to order so you can specify what you’d like inside, and there you have it; a tailor made gift basket which will be perfect for him. Pairing cheese with different crackers, meats, and condiments is one of life’s simple pleasures, especially when you discover a new winning combination. This gift basket has everything you need, either give it as a gift or put it out at your next dinner party. Your guests will love it. Perfect for Dad, this gift basket is filled with an assortment of tasty retro candy which he’ll remember from his childhood and teenage years. The candies included are either rare or difficult to find so make sure he knows that before he goes diving in. Most of us enjoy a cup of coffee first thing in the morning before going off to work, but what about enjoying one after our dinner? Inside this cloth lined basket, there’s an assortment of gourmet coffees, chocolates, and cookies which will make that evening coffee more than just one boring cup. Nothing says sophistication like a good glass of red wine and the two included in this gift basket are just that. Not only do you get two full sized bottles but you also get some gourmet sweet and savory foods which will pair beautifully with the vino. Whether you’re using this for movie night or a good old Netflix binge, this gift bucket is absolutely overflowing with some delicious sweet and savory snacks. M&Ms, Oreos, Swedish Fish, Cheetos…and what’s a night in front of the TV without popcorn? Dad will love it. You might have a favorite football team, but not everyone in your family will agree. Let Dad show off who he supports with this popcorn bucket which shows his chosen team’s helmet printed on the side. Fill it up with some popped corn and enjoy the football season. In the summer, you spend a lot of time in the backyard enjoying the sunshine. But what do you do if there’s nowhere to put down your drink? This DIY backyard drink caddy will solve that dilemma for you, and the best part is that it costs $2. Chess is a fun game to play but those boards get a little dull after a while. Read this tutorial and see if you’d be up for making your own chess board using nuts and bolts. It’s easy enough to customize once you know what you’re doing, so you can give everyone their own unique board. If your family are always losing the charging cables for their phones and smart devices, make that problem disappear with this amazing DIY family charging station. Never again will you be hunting around for the correct charger, they’ll all be at this recharging dock. Are you celebrating a birthday or an anniversary with a special lady in your life and want to get her something to mark the occasion? Choose one of these gift baskets for women and you’re sure to get her something she’ll love. They say a way to a man’s heart is through his stomach but we’re not sure that’s confined to men. We believe that you can make your way into anyone’s good books through food, and these Christmas gift baskets will prove it. We’ve got one for all budgets (and tastes) so take your pick. Think outside of the box and choose gift baskets for Dad this year. We’ve done the hard work for you and found the best and most mind blowing ones which are available now. There’s truly something for every Dad in here, so what are you waiting for?